Shortlinks have come a long way. Way back in the early 2000s it started with sites like TinyURL which took humongous links from the interwebs and made them – you guessed it – tiny. Using shortlinks was a great way of letting people know about an awesome web resource without giving them a huge link they had to remember or type into their browser. Fast forward a decade: shortlinks are everywhere and many brands have their own. Some public sector organisations use them but many do not. On your own website you can set up short, memorable links that redirect to a page with a longer URL. That’s all well and good, but what if you want to create a shortlink for a page on someone else’s website? You can do this easily with your own link shortening domain hooked up to bit.ly. In the example above, we created shortlinks for resources on other Queensland Government websites instead of posting their full URLs. Using bit.ly you track clicks not only to your own website but for any URL. 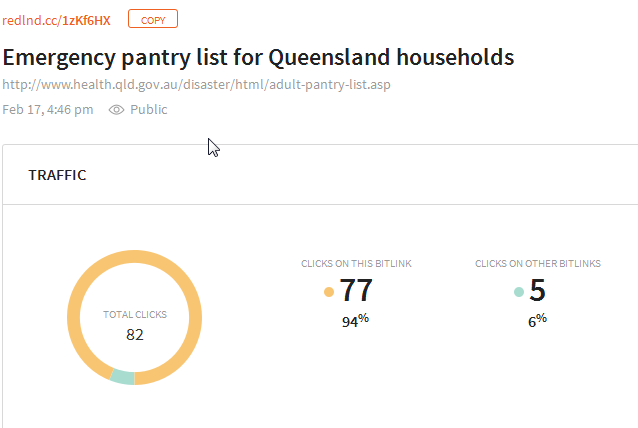 Below are the clicks from our shortlink to a page on the Queensland Health website: without bit.ly we’d have no idea how many people clicked on this link. Domains are cheap, so instead of using generic bit.ly / ow.ly / t.co link shorteners, register your own unique address that ties in with your organisation’s brand. 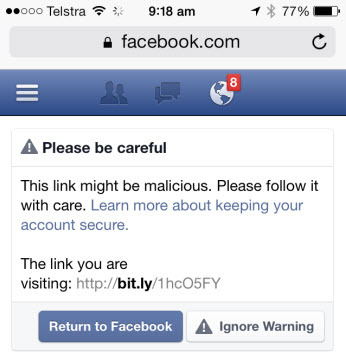 Sure you can use bit.ly’s own link URL, but sadly they have a bad rap as scammers use them to send people to nasty websites. 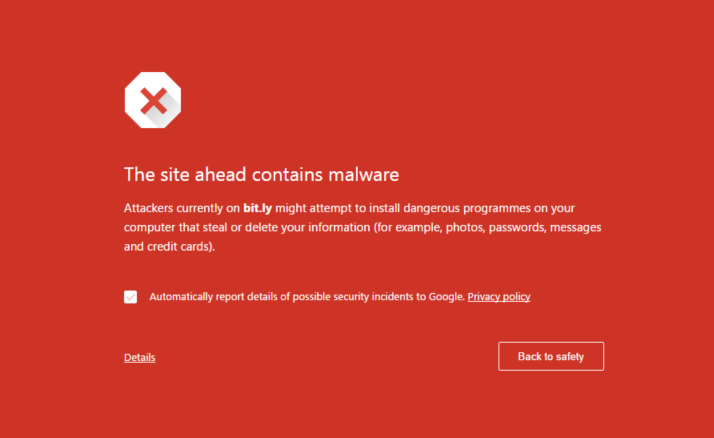 Chrome and Firefox users were locked out of bit.ly links last year due to the Google Safebrowsing service flagging all bit.ly links as potential malware. Having your own branded domain negates this issue. You can hook your domain up to Sprout Social, Buffer and Hootsuite. Just another reason why you should get one! 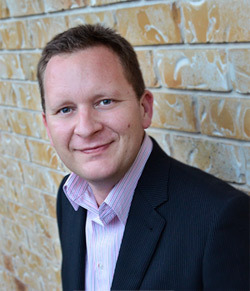 Read this excellent article from bit.ly: How to set up a branded short domain with bit.ly. Visit domai.nr and start playing around with names related to your organisation. Once upon a time a short link had to be, you know, short. These days they can be a little longer: Twitter shortens URLs of any length to 22 characters anyway. If you work in local government there are a couple of good options for you to look at: .cc and .sc top-level domains. .CC is the top-level domain for Cocos (Keeling) Islands: a tiny Australian territory in the Indian Ocean. Domains with this extension can be bought by anyone for about $35 AUD per year. This top-level domain is ideal for city councils or county councils. Brisbane City Council have set up bne.cc for their short links (BNE being the 3 letter code used for Brisbane Airport). 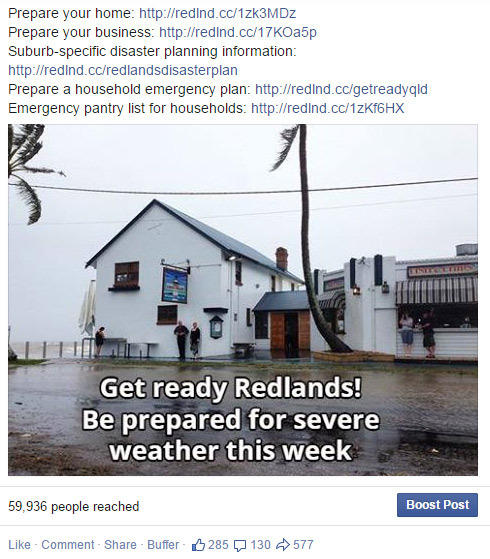 At Redland City we use redlnd.cc as redland.cc was already registered. Redlnd.cc follows in the spirit of other shortlinks from companies like Google (goo.gl) and NY Times (nytm.es) who dropped a vowel in their branded domains. .SC is the top-level domain for Seychelles: they are a bit more expensive at around $110 US per year. The .sc top-level domain is a good option for shire councils. Another option you have for creating a branded domain is a domain hack. For example, buying a Spanish .es domain would be a good choice if you want to register [yourtown]librari.es. Does your organisation use a branded domain for shortlinks? Let me know in the comments section below!